Description - Our Mega-Lock rubber tiles are a great choice for heavy free weight lifters or anyone in need of a durable rubber tile solution. These tiles are available in corner, border, and center cut tiles which makes installing them in kits a cinch. The tiles can also be cut with a simple utility knife and straight edge for wall to wall installations. These tiles are a molded tile and are safe to use inside and out. The interlocking design and heavy weight of each tile allows for these tiles to be loose laid which means that no sticky adhesive is required for installation. Note: Tiles have an unfinished bottom which may result in a variation in height. Material – Recycled crumb rubber and colored EPDM rubber flecks. Crumb rubber comes from whole recycled tires which helps ensure that those tires don’t end up in landfills. Size – 30" x 30"
Recommended Uses – In commercial gyms where free weights are used, weight rooms, power lifting stations, locker rooms, pet care facilities, horse stalls, any place where an anti slip surface would be beneficial, under exercise equipment, storage sheds, and any other place where a durable rubber floor tile solution would be helpful. The extra thick nature of the rubber tiles also helps protect sub floors from dropped weights or any other heavy item. Occasional damp mopping of the floor tiles with a mild soap and water solution. A few recommended soaps are Dawn dish detergent or Tide laundry detergent. Larger interlocking tabs prevent separation. Corner, border and center tiles for easy installation. Rubber flooring inc had good prices and the shipment was fairly quick. The interlocking floor is slightly different than what I have but I made it work with a small modification. The flooring itself is outstanding. 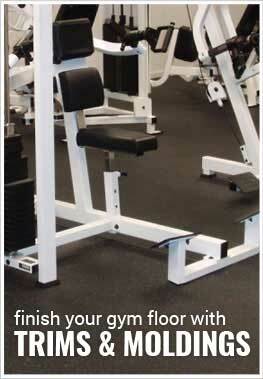 1/2 inch is plenty for gym flooring. Excellent gym floor! I've had the flooring for a few years now and thought it was a good time to report on it. The tiles are not light, but installed easily enough. The only small draw back to the mega lock is I think it might gap at the seems a tiny bit more than the normal tiles, but not a major issue. Overall the flooring looks awesome and is holding up great. I have absolutely no regrets and highly recommend it. We purchased this item for our home gym/office and its perfect for our needs. It does show dirt quite easily and isn't the easiest to clean, but with patience and a good vacuum it cleans up. The product is very good! I used the auto estimator and I am still short 80Ft2, so I have to place an additional order.